Raft Banff and the Kicking Horse River with Lake Louise celebrities Ted and Liz! Come whitewater rafting with in Banff, Canada with Banff Travel and Wildwater Adventures, the official outfitter of the Kicking Horse River, just outside of Banff and Lake Louise. The famous Kicking Horse River is the best of the Alberta rafting opporunities. We offer whitewater rafting day-trips and multi-day Banff rafting trips on the famous Kicking Horse River, near Banff National Park and Lake Louise. Our Banff, Alberta rafting trips are perfect for singles, couples, families and groups, and all abilities and ages, from 8 to 90 years of age. Celebrities of all kinds choose Banff Travel and Wildwater Adventures as the Canada rafting outfitter to take them on a rafting adventure. Olympic Gold Medal winners, NHL, NFL and MLB professionals, Hollywood celebs and others all enjoy the best of banff rafting trips. And everyone, including non-celebrities, enjoy our cozy riverbase day lodge. Come Rafting With Local Banff Lake Louise Guides! Of course, owners Ted and Liz Bilton (Banff celebrities in our minds, of course) are local owners who live the dream of rafting the Kicking Horse River every day and living in Lake Louise, Alberta. Let us help you with your whitewater rafting trip planning. Kids LOVE Rafting With Us! The most popular daily Alberta / British Columbia rafting trips are available from mid-May to mid-September and we have trips designed for first-timers, experienced rafters and nature-loving families. For rafting trips in Banff, and rafting trips in Lake Louise, Banff Travel and Wildwater Adventures are your choice for your BC and Canadian rafting nirvana. Choose from a variety of exciting Banff, Alberta white water rafting trips and milder river journeys. 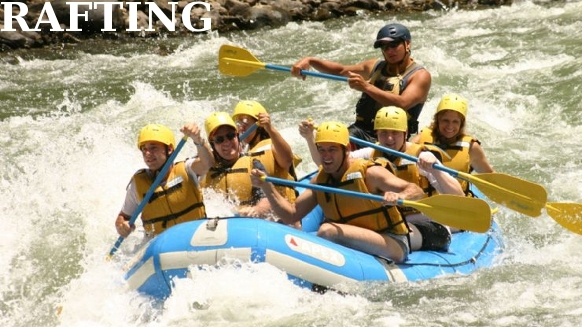 River rafting trips range from our popular daily half-day rafting trips, our full day rafting trips, or our gentle rafting trips. With more time to spend in the Canadian Rockies, try one of our great multi-day Banff area white water tours for an unbeatable family vacation. Got a group? We can easily accommodate your adventure travel groups of 12 to 100 for a full day of rafting – perfect trips for businesses, schools, youth, church and social groups. You’ll love our group rates, starting with just 8 rafters. Check out our new “Corporate Play Day” for groups from Calgary! Raft safe and enjoy Canadian Rockies white water rafting with Banff Rafting Alliance and Alberta Rafting Alliance certified rafting outfitters. Check out this Banff/Lake Louise Rafting video and hit the whitewater this summer! Rafters can hang on to our safety lines positioned around the raft. Unlike others, we use a guiding system so that our guests can securely hold on and “get down” when the guide feels it’s necessary, but they can still steer the raft. Second, our safety briefings and demonstrations are clear, concise and thorough…we don’t rush through this just to get you on the river. We want you to be prepared.